Tavern…lounge…pub…café…saloon. Call it what you may, a bar by any other name is still a bar. Sometimes, a low-key, down-home beer joint can be just what the doctor ordered. Other times you might crave the serene atmosphere of a ritzy cocktail lounge. In addition to an affable bartender and the proper knowledge of the art of mixology, a touch of history can also contribute to the factors that make a bar memorable. Here are a few of the places where you can find some of the world’s most memorable watering holes. NEWPORT, RHODE ISLAND is a beautifully preserved walking-city with an architectural tapestry dating back to the 17th century. You can stroll through history on Newport’s dramatic 3.5 mile Cliff Walk where paved walkways and stone paths wind along the island’s southeastern edge. The Cliff Walk is bordered on one side by the massive mansions (aka “summer cottages”) of America’s turn-of-the-century elite and on the other by granite cliffs and pounding surf. 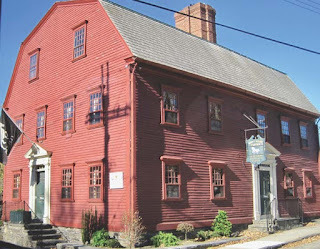 Paying homage to the past as it celebrates the present, this “Sailing Capital of the World” is home to THE WHITE HORSE TAVERN, the oldest bar (1673) in America. in its early pirate days, Newport was one of the rum capitals of the United States. The Dark and Stormy (non-alcoholic ginger beer topped off with Gosling's Dark Rum and a lime wedge) is the tavern’s signature drink. SINGAPORE, the city/state/island colonized by Sir Stamford Raffles in 1819, is a study in contrasts. It is a tropical paradise brimming with towering skyscrapers and old Chinese shophouses. It is the clamor of commerce and the tranquility of vast parklands. It is a "computer-age city where the age-old abacus is never far from hand." Once shrouded in mystery, Singapore's dynamic present has been magically melded with her fabled past. Nineteenth-century, reverential temples coexist with modern skyscrapers. Rickshaws and Rolls Royces share cobbled lanes and concrete ribbons. Although the Singapore of the 21st century is no longer the romantic Singapore of Rudyard Kipling and Somerset Maugham, an exotic Asia is still in evidence in this high-tech, immaculate city lying just over one-degree north of the Equator. 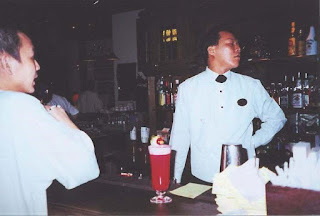 Raffles, the famed French Renaissance-style hotel (1887), to which thousands of visitors to "Lion City" flock each day, is home to THE LONG BAR where the renowned pink Singapore Sling was concocted in 1915 by bar captain Ngiam Tong Boon. The bar’s earthy interior is reminiscent of a Malayan plantation in the 1920s. Sipping this fruity gin-based cocktail at its birthplace is a travel rite of passage and a must for any reveler’s bucket list. FRANKFORT, KENTUCKY opens up the door to Kentucky history. And Frankfort’s Serafini Restaurant & Bar opens up the door to the best ever Fried Green Tomatoes, with Roasted Tomato Jam and a Balsamic reduction. Serafini’s elegant proprietor Wayne Masterson is the restaurateur often selected to orchestrate Kentucky State Dinners. 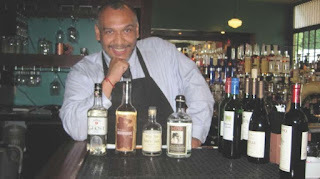 However, it was the affable manager/bartender Carlos Ceballos, black-aproned behind the SERAFINI BAR, who poured me my first tastes of Kentucky Moonshine with names like Buffalo Trace White Dog, Devil John No. 9, Jim Beam Jacob’s Ghost and MBR Blackdog. Frankly, I’ll just stick to plain old bourbon! VENICE, ITALY is the legendary city where more tourists ask directions to HARRY'S BAR than to the Piazza San Marco. Harry's Bar--the one and only original Harry's Bar--is not your ordinary watering hole. It is a fashionable haunt frequented by celebrities, royalty, locals, and tourists. It is quite possibly the most famous bar in the world. Whether you're properly seated at a square table covered in elegantly simple Frette linen, or hanging off a bar stool with the rest of the beautiful people, (jean-clad or sable-swathed, it makes no difference) chances are you'll be sipping the bar's liquid trademark...the Bellini. This ethereal concoction was created by Giuseppe Cipriani who founded Harry's Bar in Venice in 1931. The Bellini is a magical blend of white peach juice, sugar and sparkling Italian Prosecca wine (often mistakenly dubbed champagne). At Harry’s Bar, unlike other bars, your Bellini will not come in a champagne flute. It is served in an 8-ounce glass with the image of a bartender and cocktail shaker etched on it. 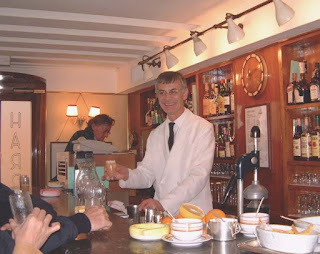 It is a pricey drink, but it is part of the quintessential Venice experience. COPENHAGEN, DENMARK and the classic movie Hans Christian Andersen are practically synonymous. 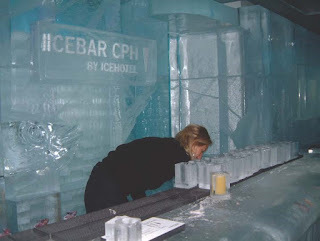 And who can ever forget actor Danny Kaye singing: “Wonderful, wonderful Copenhagen, friendly old girl of a town...’Neath her tavern light, on this merry night, let us clink and drink one down…” Nor will I ever forget my first drink at the ICEBAR in Copenhagen. Not only did I ‘clink and drink one down’, but I clinked and drank one down very, very quickly. Why quickly, you might ask? Because the temperature in the bar in which I was imbibing was a crisp 23-degrees Farenheit. It was a pure, 100% authentic, Icebar! Before chilling out in the Icebar, I donned a bright blue cape and mittens trimmed in snowy white faux fur. After being garbed for my Arctic adventure, I was escorted into an air lock and the door closed behind me. Then, voila, the door into the Icebar opened. Lo and behold, there it was. An entire room crafted of ice from the Torne River in Swedish Lapland… the walls, the bar, the tables, the booths, and hundreds of glasses…all produced from clear, pure, Arctic river water. NASHVILLE, TENNESSEE is a “Nash-ional” treasure. Nashville's heart beats to music. Folk music that crossed the Smokies with early settlers…toe-tapping fiddle and banjo music…mournful hill ballads…tunes that grew into down home "hillbilly" music that filled the barns and the countryside. With the advent of The Grand Ole Opry, that music grew into a gentle, more sophisticated country-western sound. Known as "The Nashville Sound", this music is loved throughout the world and earned Nashville its name: Music City, USA. 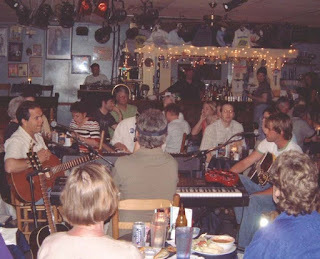 Nashville’s BLUEBIRD CAFÉ is an intimate, 90-seat, full-bar, music venue where you might chose a local craft beer (such as Jackalope, Wiseacre or Yazoo) as songwriters and artists perform their music. This unassuming, world-renowned Nashville classic, located in a small strip mall outside of downtown Nashville, helped launch the careers of many country stars—including Garth Brooks and Taylor Swift. Over 70,000 people visit the venue annually. Janet Steinberg, winner of 47-travel writing awards, resides in Cincinnati but calls the world her home.